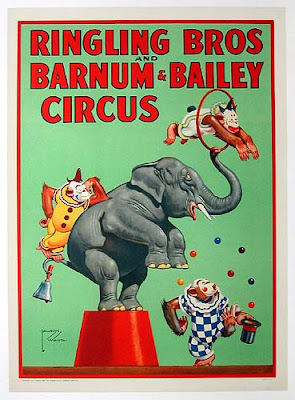 I was knocking around the web, looking at vintage circus posters stepping off from my post yesterday. The circus posters were on my mind--and I wanted to see where it would take me. In my travels, I discovered Lawson Woods, an illustrator in the 30s who did this poster. As I googled him, I found him doing postcards and jigsaw puzzles with this "Gran'pop" character who happens to be a monkey. Weirdly wonderful work. By 1906 his comic style was at its best; clean-lined and colourful and his sense of humour sharp and observant. It was in this year and in those immediately following that he produced some of his most impressive work. Lawson Wood's popularity and his reputation as a leading comic artist were well established. He was especially noted for his "prehistoric" humor that paired stone age humans with caricatures of dinosaurs, like the 1903 example above (which appeared in the 1905 Printer's Pie in duotone). When the noted art instructor Percy V. Bradshaw created The Art of the Illustrator (a collection of 20 portfolios showing six stages of a single painting or drawing by 20 different artists), Wood was chosen to lead off the series - an indication of his standing in the artistic community. The final stage of his painting, "Ring Time" is at right. 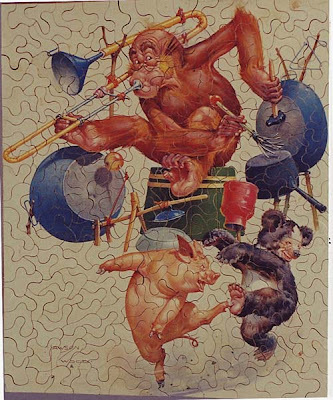 Lawson Wood gained immense popularity with his humorous drawings of comic policeman, dinosaurs, prehistoric and Stone Age characters, and apes and monkeys often seen performing absurd antics against immaculate, dead-pan backgrounds. Eventually Gran'pop, the artful ginger ape (see sample at right from the cover of one of the Gran'pop's Annuals and also used on the cover of the September 30, 1939 issue of Collier's), and the rest of the chimpanzee family were to bring him fame on both sides of the Atlantic. The Gran'pop's Annuals were a yearly excursion into comic absurdities that were popular around the world. Cartoons were made featuring these characters and, but for the outbreak of World War Two, would have been turned into an animated film by Ub Iwerks' studio in Hollywood. Does anyone have any other information on Lawson Woods?